Manufactured by J. C. Deagan, Inc., the Diana (Model Number 40) marimbaAn instrument that consists of a large frame and a set of tuned wooden bars which are struck wi... design was introduced in 1938 as “An Irresistible Combination of Exquisite Beauty, Superlative Tone and Low Price.” It came on the market two years after the more expensive Deagan Imperial model as a moderately priced alternative that maintained superior tone and appearance. 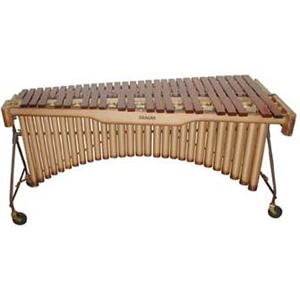 Designed to be highly portable, it used the standard Deagan tubular “deluxe wheel rackA metal assembly that surrounds the drum set and holds the top parts of cymbal stands as well a...” frame construction from earlier instruments with split rails for the bars, as well as lightweight, tempered-aluminum resonatorsThe metal pipes that extend below the bars on a marimba, xylophone, or vibraphone. They carry t..., which were finished “in a richly shaded gold bronze lacquer” and split for ease of packing. 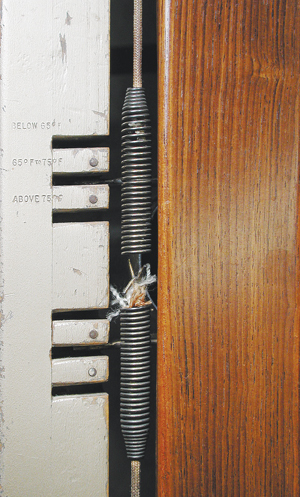 At its introduction, the Diana model was only available in a four-octave range, C (below middle C) to C. The Honduras rosewood bars are graduated in size from 2 1/4 by 15/16 to 1 5/8 by 3/4 inches, and range in length from 17 3/8 to 7 1/4 inches. With a height of 35 1/8 inches and a length of 75 inches, the instrument weighs 107 lbs. At its introduction, the list price was $195.00, and a set of four fibre cases for the instrument cost $65.00. 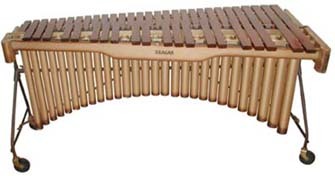 Deagan maintained the model number (40) and name (Diana) for later instruments, with significant modifications to the frame and ranges. Before her death in 1955, this instrument was the property of marimbist Jean Margaret Hawkins. Of interest are the signatures of Wesley A. Leatherosk and Clair Omar Musser on the small and large end boards respectively.